Indraprastha Apollo Hospital’s dedicated Apollo Obesity and Metabolic Surgery Centre” provides a truly world class service to patients right here in New Delhi. 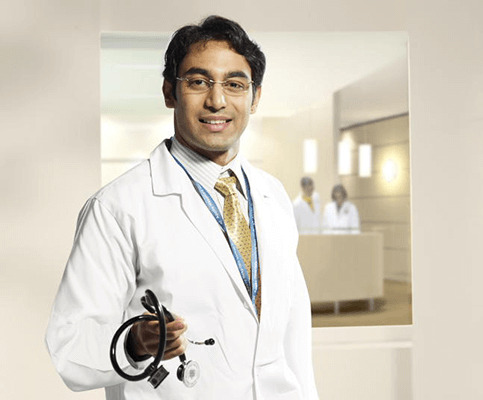 Our surgeons are renowned figures in the field, who have trained and worked in the best centers in the world. They have vast experience with this type of surgery and are supported by an excellent team of experienced, dedicated anesthetists, surgical registrars, junior doctors, dieticians, nurses, physiotherapists, and managers. We have taken great care to ensure that our infrastructure all over the hospital can meet the very specific needs of obese patients. At Apollo Obesity and Metabolic Surgery Centre, we provide the full spectrum of services for obesity management, including dietary and exercise advice, gastric balloons, and a range of surgical procedures, carried out laparoscopically and robotically. Our surgeons perform all established bariatric procedures and will recommend the best procedure for you, depending on your individual needs. Typically we perform Sleeve Gastrectomy, Mini (Omega Loop) Gastric Bypass, Roux –en – Y Gastric Bypass, Gastric Banding, and Gastric Balloon insertions. This operation involves removing a large portion of patient’s stomach using surgical staplers. Stomach capacity is reduced from the normal of 1.0 – 1.5 liters to 50-150 ml, thus decreasing food intake. It also decreases patient’sappetite. Since the transected part of stomach is physically removed from patient’s body, it is an irreversible operation. Some patients prefer it, as it does not involve surgery on bowel and has a better safety profile than bypass. 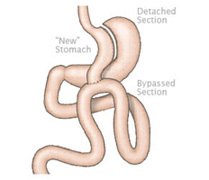 Patients should however be aware that some patients can develop acid reflux after this operation and the weight loss is generally poorer than the bypass. There is less need for long term vitamin and mineral supplements after this procedure. 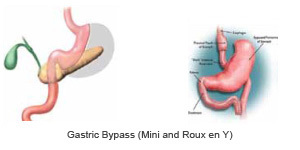 Gastric Bypass: Gastric Bypass involves creation of a small gastric pouch which is connected directly to small bowel. Most of the stomach and approximately 2.0 meters of small bowel is bypassed, using surgical staplers. This operation decreases the amount of food a patient can eat, also prevents absorption of some of the consumed calories, and reduces appetite. It is possible to reverse gastric bypass. Though Mini Gastric Bypass can be reversed relatively easily, reversing a Roux en Y Gastric Bypass laparoscopically can be very challenging. Weight loss and improvement in diabetes are superior with bypass but that comes at a higher need for vitamin and mineral supplements in the long term, and a slightly worse safety profile compared to sleeve gastrectomy. It involves placement of a silicon band at the top of patient’s stomach. The band works by reducing the food intake but results can be highly variable and depend largely on a patient’s ability to work with it. Patients need regular band adjustment and many patients need reoperations in the long term to adjust band port/tubing or to remove the band. It is carried out endoscopically and involves placement of a balloon inside patient’s stomach. Balloon reduces the food intake by taking up the space inside a patient’s stomach. It is however a temporary device and has to be removed after 6 months. Weight lost during this period tends to come back if individuals are not careful. Your surgeon may recommend this to you to improve your safety profile prior to your bariatric surgery or if you do not meet criteria for surgery.